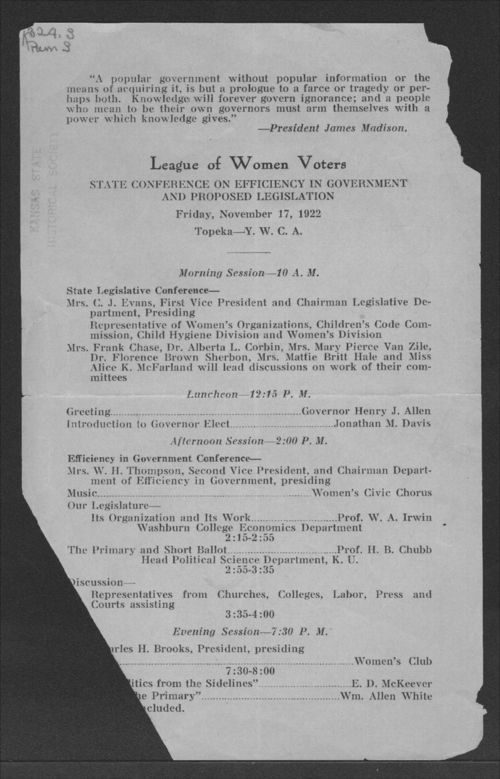 The League of Women Voters of Kansas organized this state wide meeting concerning efficiency in government and proposed legislation. It was held Friday, November 17, 1922, at the Topeka Y.W.C.A. Sessions focused on various areas of interest including health of children and how the legislature was organized and worked. Governor Henry J. Allen and Governor-elect Jonathan M. Davis made remarks at the luncheon. The evening speaker was William Allen White, Emporia. Representatives from government agencies and community groups attended as well as League of Women Voters members. The bottom left corner of the program is missing.